It started with a dream, and then a letter from a person who had immersed herself in the history of the Heligan estate. When Candy Smit of the Lost Garden s of Heligan then contacted Bill Mitchell, Artistic Director and founder of WildWorks Theatre, little did they anticipate the journey ahead of them which would take so many people and whole communities along too. What ensued was a dawn till dusk, continuous theatrical event that was a unique collaboration between a theatre company and a tourist attraction. 100: The Day our World Changed brought together community performers young and old, banner and bunting makers, brass players, singers, stewards, gardeners, historians, flower-growers and motorbike enthusiasts with Wildworks theatre makers and the Heligan team. Everyone exchanged knowledge, skills, memories and a shared vision to create a truly spectacular day of remembrance on the 3rd of August 2014 supported by a 6000 strong audience. Together, they relived and retold the lives of brave Cornish men from the parishes of Mevagissey, Gorran and St Ewe who went to war, and the families they left behind. From the calling of names at the three war memorials in the stillness of sunrise to the arrival of a red-sailed lugger and the festivities and anticipations at Mevagissey harbour, the audience travelled through the village alongside ‘our’ boys and continued on to Heligan Gardens. 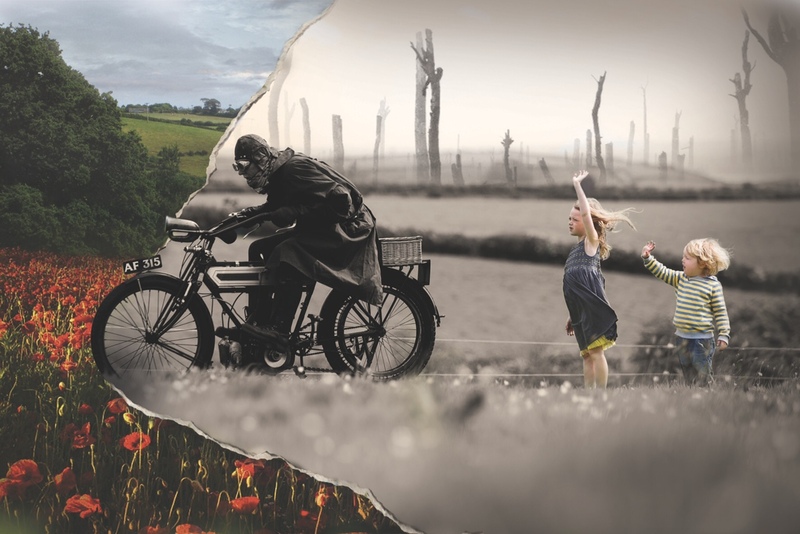 Performers and musicians held everyone captivated throughout the afternoon, across the 26acre site in an extraordinary 1914 / 2014 world, set within a ‘living stage’ of sweeping fields, traditional practices and heart wrenching views. The Lost Gardens of Heligan had been turning back the hands of the clock for over a year and Heligan became an authentic, 1914 garden. The audience watched the boys advance, cutting through the crowd and heading to the shadows in the valley below as a symphony of spoken memory. Sound, performance and pyrotechnics created an all-encompassing experience, both panoramic and intimate. At the end of the day the audience stood in a field of poppies and wildflowers planted a year before by the Heligan gardeners. Entranced, for over an hour, they watched the lost men & women depart on their final journey, listening to their names being called in a silence only occasionally broken by families applauding the name of a great grandfather or uncle as a sign of affection and respect. An unforgettable day. It was important and beneficial to perform back in Cornwall and reignite a wide Cornish following. Partnering with an organisation that has areas of expertise to draw from and takes responsibility on the project for things like marketing, customer management, data capture was also extremely useful. Working with a Commissioning partner financially makes bringing work to Cornwall possible. In an area like Cornwall, without an international arts festival or central producing hub, tourist attractions become the likely commissioning partner.